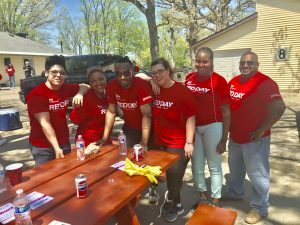 Yesterday, The Mattz Group spent the day with 150 other agents at Shady Oaks Camp in Homer Glen for our annual R.E.D. Day. It was a great day of volunteering and getting the camp ready for the summer campers. For a little more information about the great project of Shady Oaks Camp and Keller Williams R.E.D. Day, please keep reading. In the 1940’s there were little or no services available for people with disabilities. Seeing this, a group of dedicated parents of children with Cerebral Palsy came together to form The Parents Association for Cerebral Palsy Children Inc. The Association purchased 30+ acres of land in Homer Township, Illinois in the hopes of building a summer camp which specifically served people with CP and similar disabilities. In 1947 this dream came to light with the opening of Shady Oaks Camp for Individuals with Cerebral Palsy. For the past 70 years, the dream of a few caring parents has survived through Shady Oaks. In recent years the group has grown to not only accept children with Cerebral Palsy but all disabilities. The Parents Association is a not for profit organization which is dedicated to the welfare of individuals with disabilities. It is a inter-racial, non-denominational, charitable organization chartered by the State of Illinois. The first priority of the Parents Association is the operation of Shady Oaks Camp. They have also been instrumental in securing two residential group homes, located on camp grounds, for individuals with disabilities. These homes are operated by Lutheran Social Services and are not connected with Shady Oaks Camp. The operation of Shady Oaks ranges from $400,000 to $450,000 per year, with most of the expenses incurred during the eight week camp period. This cost does not include improvements and maintenance to the buildings, electrical and plumbing, and septic fields. The cost of these repairs varies from year to year. Because the Association is a not for profit, private organization the money to run camp must be raised by the parents. Many fundraisers are conducted throughout the year to help bring in money. These fundraisers include raffles, dinner dance, tag days, Poker games and our annual SOB Motorcycle run. Beside fundraisers the parents receive cash donations from various supporting organizations.